Fall has arrived early this year....and substantial reds come to mind. This year, last spring, we were waiting for winter to be over. Summer only arrived by the end of June and it rained a lot with only a few nice days and mostly stormy, humid and soggy days for about 2 months. And by the 31st of August, it felt already like Fall, or as we say in French: Automne. Colder nights and crispy, refreshing mornings, complemented by a slightly chilly wind blowing already some dry, brown and yellow-beige leafs gathering on the pavement. Although, I will have preferred a longer summer and I'm hoping that we will have a very enjoyable, sunny Indian summer, I need to admit that I like Fall. I love its changing colors and shades in the woods, forests, fields, park and countryside from green and pale yellow-crème to bright yellow and red to blond and Burgundy and Brown, and all the nuances in between. It is now time to think less about vivid white wines (although dry whites are nice all year long, they fill nicer and fresher during spring and summer, and somewhat too cold in winter) and more about heavier rosés and richer, earthy reds. So here is a fuller, spicier and richer red from the Rhône valley produced by Jean-Luc Colombo. Before writing this post, I'd like to explain (again) my view about big names, labels and brands. So, I will not necessarily write an entire post about Jean-Luc Colombo, first because he is really well-known and already quite a few people have wrote something about him and his wines, but also because I always pride myself to write about lesser known producers and small, more artisanal winemakers and unknown estates from lesser known regions. One may think that I should also write about big names, brands and labels, but frankly, and it is the same for my buying strategy when I buy wines and spirits for the store, I try to limit them or even avoid them as much as I can. Don't get me wrong, I'm always happy to taste them, but I rather not buy and sell them in the store. Already too many stores have them on their shelves and I like to be different and offer more values from lesser known, unfamiliar names with no ratings, little press and little distribution. Of course, some are difficult to pass by and ignore... they became the usual suspects of high-end wine and the pride of some wine stores due to small production, allocated quantity, highly expensive price, high demand, high rating, important marketing, reputation and history...and it is fine, some of them are very good to great and some have been the leading flagships of their appellation for years which make them even more attractive and more valuable for both wine buyers and consumers... but I rather detached myself from all of that, walk outside of the main path and specialize myself in lesser established producers, winemakers and estates. However, a few days ago, my boss gave me 2 bottles of 1997 Jean-Luc Colombo Cornas "Les Ruchets" Rhône Valley France, for me to try at home. So I thought that It might be a good idea to write about it, to describe the experience of tasting what could be considered as an old wine. The long cork was moist and in very good condition. It the glass, the color is dense and intense yet blurry or cloudy (due to no filtration), quite opaque brown with a few sediment. Not knowing the state of the wine and due to the 1997 vintage which wasn't great in the Rhône valley (and in many other places in France in general), I decided not to decant it. 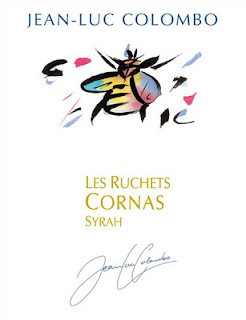 At first, the nose of this 100% Syrah Cornas "Les Ruchets" was very expressive with interesting tertiary aromas of old prune, under-bush, forest floor and balsamic with a touch of spices and hints of oak and violet. After about 5-10 minutes, the nose evolved weirdly with more accentuated mixed aromas of alcohol and old wood, a touch musty and more balsamic notes. After about 20-25 minutes, the initial weird aromas dissipated to go back to old prune, ripe dark cherry, kirsch, violet, balsamic, spices and oak notes. In the palate, the attack is still pretty full and rich and expands quickly in the palate with super ripe dark cherry and plum flavors, with oak notes, hints of spices and bitter chocolate. Although the finish remains quite juicy and long yet a bit inharmonious, the old prune and dark cherry fruit seem too overripe and the oak is not integrated and hasn't settled yet. Also the balsamic notes and acidity and the musty notes are very present and not satisfying. May be it is only a matter of opinion or palate, however, my overall view is that this earthy wine seems a bit old already, unbalanced and too over-rippe, like cooked or stewed. The bitter dark chocolate and woody flavors may suit the palate of certain persons. The kirsch and super ripe dark cherry, old prune profile may interest some others, but overall, even if this wine presents no real big defaults yet some angularities and signs of bad ageing, I will not have any pleasure to finish the opened bottle. The finish also presents a slight mustiness, bitterness and seems very raw (touch dirty due to no filtration). I couldn't resist to open the second bottle of 1997 Jean-Luc Colombo Cornas "Les Ruchets", to see if it tasted the same or similar as the first one. In fact, I was surprised that it was slightly better and more balanced overall and seemed fresher, not as ripe and oaky in the attack and the mid-palate. Yet the slight mustiness and slightly inharmonious, earthy, almost dirty finish (due to no filtration) remained somewhat the same as in the first one. A more interesting experience, yet still not great or put together.... Tampis! Although I usually like quite a few of the wines from Jean-Luc Colombo, tasting this 1997 Cornas Les Ruchets confirmed two things for me (and it is my opinion). First that 1997, even if a lot wines received good to very good ratings at that time and that the vintage was considered good to very good by some influential wine critics and magazines (that I will not name, but if you read my blog often, you probably know already my point of view on certain personalities and critics of the wine world), it wasn't that much of a great vintage in the northern Rhône to begin with (lot of dry tannins not yet settled and many over ripe wines with low acidity). And secondly that Jean-Luc Colombo has made a lot of progress for the better and slightly changed his style since then, because the last few wines that I tasted from him were pretty good, more balanced, and although younger, the oak was more settled and the acidity lifted the fruit character on a nicer, needed way. In any cases, Jean-Luc Colombo remains a producer that I like. He is a benchmark of the northern Rhône who will always make rich, structured and forward wines. The last few wines that I tasted were La Louvée Cornas, Viognier La Violette, Les Abeilles Côtes du Rhône rouge that I bought for the store, but I will describe them in another post.